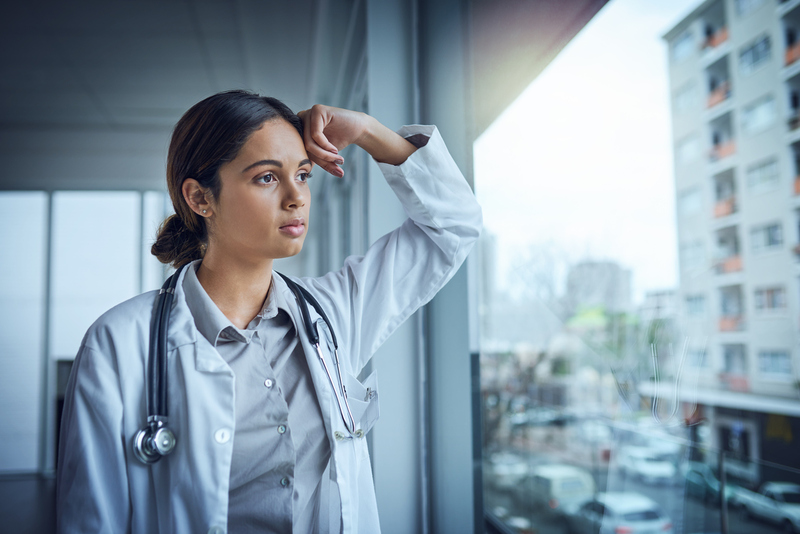 Symptoms of burnout and regret over career choice are common among second-year resident physicians (PGY-2) in the United States, but these symptoms vary according to specialty, reports a study published today in JAMA. Overall, 45% of PGY-2 residents reported symptoms of burnout and 14% reported career choice regret. “The findings suggest the prevalence of burnout symptoms among resident physicians may be similar to that of practicing physicians (48.8%) and higher than other U.S. workers (28.4% as assessed in 2014 using the same single-item measures adapted from the MBI [Maslach Burnout Inventory]),” wrote Liselotte N. Dyrbye, M.D., M.H.P.E., of the Mayo Clinic and colleagues. The residents had previously completed questionnaires at the start of medical school and again four years later. In addition to collecting general demographic information, the questionnaire administered during the fourth year of medical school asked participants about anxiety, empathy during clinical encounters, and social support during medical school. The PGY-2 questionnaire asked participants about the frequency of experiencing burnout-related feelings or emotions (“I feel burned out from my work” and “I’ve become more callous toward people since I started this job”) and career choice regret. Of the 3,574 residents included in the analysis, 1,615 (45.2%) reported at least one symptom of burnout at least weekly. In terms of career and specialty choice regret, 14.1% of the residents reported they would “definitely not” or “probably not” choose to become a physician again, and 7.1% indicated they would “definitely not” or “probably not” choose the same specialty if given the chance to revisit their career and specialty choice. In a separate article in JAMA, Lisa S. Rotenstein, M.D., M.B.A., of Harvard Medical School and colleagues describe the results of systematic review of studies on the prevalence of burnout in practicing physicians (physicians in training were not included) published before June 1, 2018. Burnout prevalence data, extracted from 182 studies involving 109,628 physicians in 45 countries, were included in the analysis. The review revealed “remarkable variability in published prevalence estimates of burnout, with estimates of overall burnout ranging from 0% to 80.5%. This wide range reflected the marked heterogeneity in the criteria used to define and measure burnout in the literature, with at least 142 unique definitions for meeting overall burnout or burnout subscale criteria identified,” the authors wrote. The findings “highlight the importance of developing a consensus definition of burnout and of standardizing measurement tools to assess the effects of chronic occupational stress on physicians,” Rotenstein and colleagues concluded. To learn more about individual and organizational interventions for burnout, check out APA’s Wellness Toolkit.